In July of 1961, St. Mary’s Catholic Church, one of the oldest churches in the city, was being prepared to be razed to make way for the River Hills urban renewal project. The Gothic styled landmark, located at Second and Crocker streets, was completed in 1877. 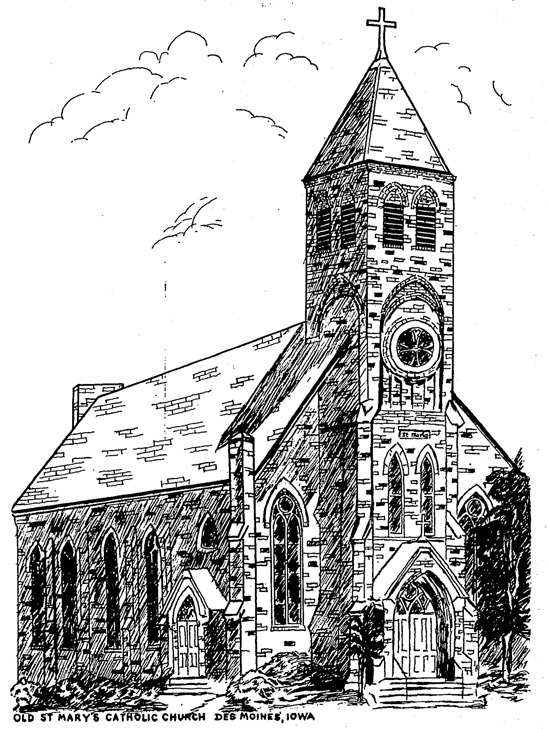 St. Mary’s parish was established primarily for German speaking residents of Des Moines. German was spoken and taught in the school during the early years. However, a few families of Italian extraction, also were parishioners during the existence of the church. Such names as Jiacopetti, Comito, Scalise, Grandanette, Andreucetti, Simonini, Rinaldi, Marchetti, LaCava, Prati, Leonard, Papollni, Orsucci, Capello, Palandri, Piagantini and Canarini could be found on the church list. At the time of the razing, the pastor at St. Mary’s was Father Dominic Webber, order of the Benedictine’s. The etching of St. Mary’s Church shown here was drawn by Mr. Joseph Parisi, 1321 41st Street. Mr. Parisi had completed two years in art from Art Instruction, Inc., Minneapolis, Minn. He had also taken courses in art lettering at Des Moines Tech, design and competition at the Des Moines Art Center. In 1961, he was employed at Look Magazine. The photo above was submitted by Nicholas Cinquepalmi of Crestwood, Illinois. Nicholas was born (at home) in Des Moines, Iowa in 1940. His parents were Vito Nicola Cinquepalmi and Antoinetta (Gallo) Cinquepalmi. They lived right across the street from St. Mary’s Church and Nicholas went to school at the three room structure that Fr. Dominick Webber maintained. 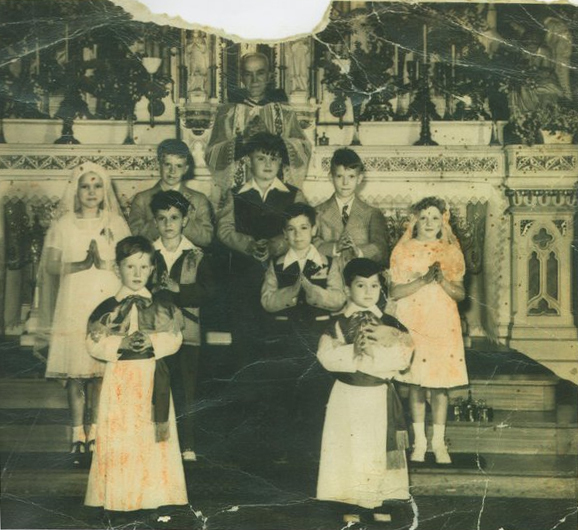 In the First Holy Communion photo with Father Dominick, Nicholas is pictured on the right hand side in the second row just behind altar boy Jody Comito. On his left is Lalo Piagentini. On the left side of the top row is Richard Hornbustle and on the right is Victor Friend. If you can identify any of the unnamed subjects in this photograph, please contact the cultural center at iaccofiowa@gmail.com.